Looking for a tractor compact enough to work in a garden but with plenty of power to make easy work out of tough jobs? 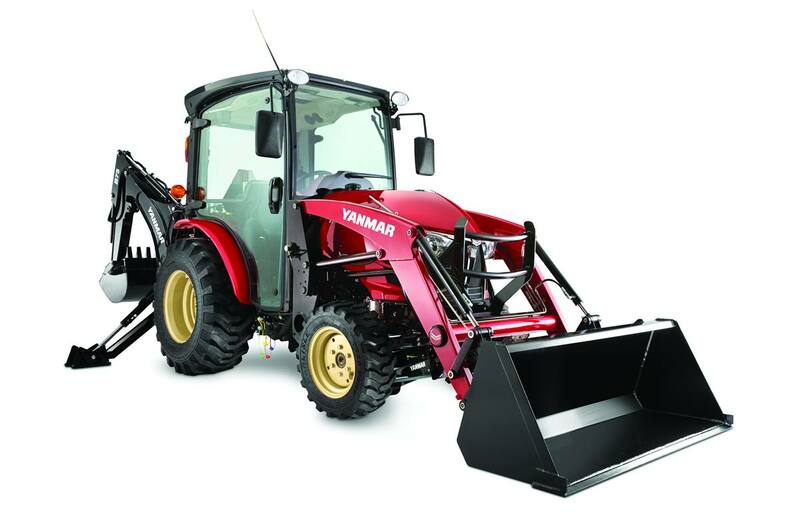 Look no further than the Yanmar YT235C. Comfortable and easy to operate, the YT235 packs the power you’d expect from a much larger machine. When the job requires you to work regardless of the climate or weather conditions, the YT235C with a fully enclosed climate controlled cab is the choice for you. Standard 12-volt power supply outlet. Ag (R1) - Front: 6" - 14"
Ag (R1) - Rear: 9.5"" - 22"
Industrial (R4) - Front: 25" x 8.5" x 14"
Industrial (R4) - Rear: 25" x 8.5" - 14"
Turf (R3) - Front: 9.5" - 22"
Turf (R3) - Rear: 13.6" - 16"
Raising time to full height w/o load: 2.6 sec. Lowering time w/o load (power down): 1.6 sec. Bucket dumping time: 1.0 sec. Bucket rollback time: 1.5 sec. Ramp angle (w/industrial tires): 15 deg. Ag (R1) Front: 6” - 14”, Rear: 9.5” - 22”; Industrial (R4) Front: 25” - 8.5” - 14", Rear: 25” - 8.5” - 14"; Turf (R3) Front: 9.5" - 22”, Rear: 13.6" - 16"